The subterranean-dwelling critter known as Eurycea rathbuni, or the Texas Blind salamander, is a highly endangered species that is extremely scarce and as a result, very little is known about it in its natural habitat. 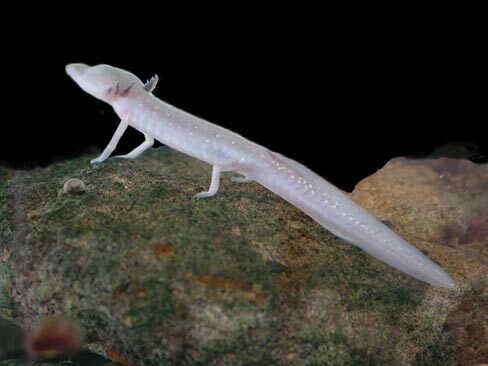 Put quite plainly, it is difficult to even reach the deep underground levels where this pale, translucent amphibian is found, let alone to conduct an effective study of them in this environment. Therefore, what is known about them comes from aboveground studies of relatively small but effective populations of E. rathbuni. 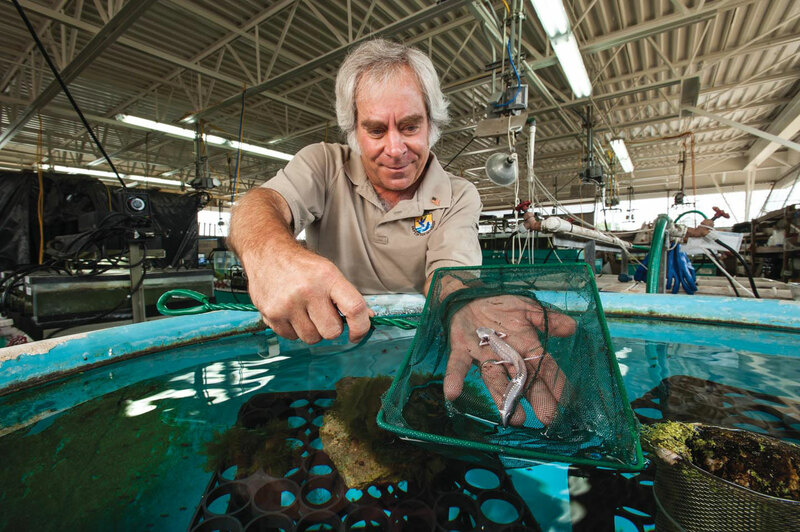 Most salamanders are predatory and the same holds true for the Texas Blind salamander. Its primary diet has been found to consist of mostly of snails, shrimp (similar to ones like the Alabama Cave Shrimp), and other small crustaceans known as amphipods (DigiMorph Staff- The University of Texas at Austin, 2014). A key feature of these organisms is that they are all invertebrates, which can tell us even more about the interactions E. rathbuni has with fellow species. This demonstrates to us that it is mostly designed for eating prey that is relatively easy to catch and devour. This can be expected, for as the name suggests, this organism happens to be blind! Therefore, other means of catching prey is necessary (such as hearing, smell, feeling, and possibly even taste), but the easier the prey is to catch (think: slow moving snails) the less exertion is required from the salamander. It may lack vision, but it makes up for this with its extreme sensitivity to changes in water currents (TPW). Similar to the lateral line system in a fish like the Ozark Cavefish, this sensitivity allows the Texas Blind salamander to “feel” when and where a potential food source is moving. It can then hone in on its prey with the same precision exhibited by a bloodhound on a scent trail. This transmits to a better chance of survival and a decreased chance of having to risk and exhaust itself over acquiring food. As far as it is known, Texas Blind salamanders are the top subterranean predators for their particular habitat. Due to the nature of the habitat, large organisms are virtually non-existent, meaning that E. rathbuni is about as big as most organisms are going to get. This does not rule out the possibility that this salamander has a natural predator, but it has yet to be discovered if it does. It has also not been determined as to whether or not E. rathbuni shares any mutualistic, parasitic, or commensalistic relationships between fellow underground species, but at this point it is not believed to be the case. It is principally a predator at the top of its food chain. The Texas Blind salamander gets along well with its fellow blind salamanders for the most part. It is luckily not dangerously toxic like the Rough-skinned Newt. However, the population in captivity was observed to have eaten multiple eggs that had recently been laid by fellow salamanders. This was an isolated case and most likely happened because of the imitation environment that it was in and due to unknown stressors. It is very unlikely that this occurs under normal circumstances in its true environment. Although the Texas Blind salamander may be the top predator in its food chain and have no known natural predators, it almost certainly has one unnatural and indirect predator: humans. Because the environment that the salamander lives in is an aquifer, it is very prone to experiencing subtle shifts in chemical composition and invasion of foreign materials (such as human pollution). Any invasion of such pollution will certainly result in a detrimental effect on the already endangered salamander (EOL). Think of Eurycea rathbuni as the stereotypical “canary in the mines” type of organism: when they start to die out, we as humans will know that too much pollution is seeping into our water system and that something must be done to stop this impending danger. Though few in number, the Texas Blind salamander may serve a far greater purpose than we know-but at what risk to itself? You can see where all the information on this website came from at the References page or check out all of the pictures used on this site at the Gallery or find out a little about the Authors of this page.